These are my favorite crackers now, not only are they stunning to look at, but they taste great, look great, and are very nutritious. I bet even Dr. Lustig would approve of them since they’re a mix of soluble and insoluble fibers. Plus I mill my own flour with a Family Grain Mill, which grinds a much coarser flour than store-bought whole grain flour. I am not selling the Family Grain mill, nor do I get a commission from anyone who does or the company that makes them. Instructions and how to make crackers are in my book Crunch! Whole Grain Artisan Chips and Crackers. Low-Fat, Low-Sugar, Low-Salt Snack. Garnish or Croutons. New, Easy, No-roll method. Some flours make too hard a chip or cracker and need to be balanced with other types of flour as you’ll see in the recipes in this book. There’s no reason not to add dried onion, garlic, Italian seasoning, or Parmesan cheese in addition or instead of the black pepper — craft these to suit your tastes. 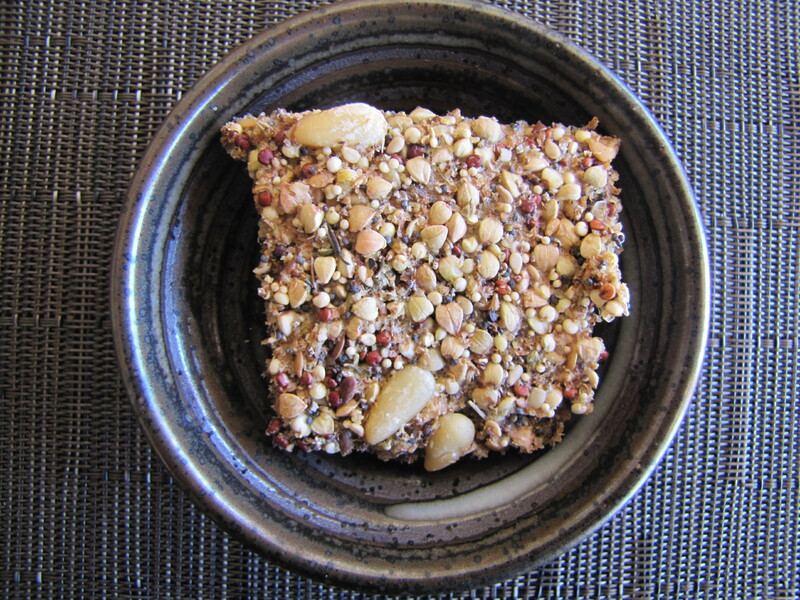 If pine nuts are too expensive, substitute sunflower or Pepita. NOTE: Stir batter well to distribute the pine nuts evenly, then quickly pour out dough. In order to bake the whole quinoa and other grains, the dough is very watery, so you’ll need to spread the dough with a spatula and to distribute the pine nuts better, which tend to migrate to the edges. If you use an egg (white), the advantage is that it’s much easier to spread the dough, water doesn’t pool around edges, it’s easier to cut the dough, the flavor and texture are slightly better, and the ingredients are less likely to fall out. The disadvantages are that they take much longer to bake, you’ll need to reheat the oven at least once, and the grains are much more muted due to being glazed over with the egg, so the appearance isn’t as good as with water. This entry was posted in Chips & Crackers, Savory Cracker Recipes and tagged best looking chip or cracker, delicious, favorite chip, favorite cracker, healthy. Bookmark the permalink.